After learning the nickel corner position, in which he’s fairly inexperienced, rookie Mike Hughes said the plan is to remain there heading into training camp in late July. 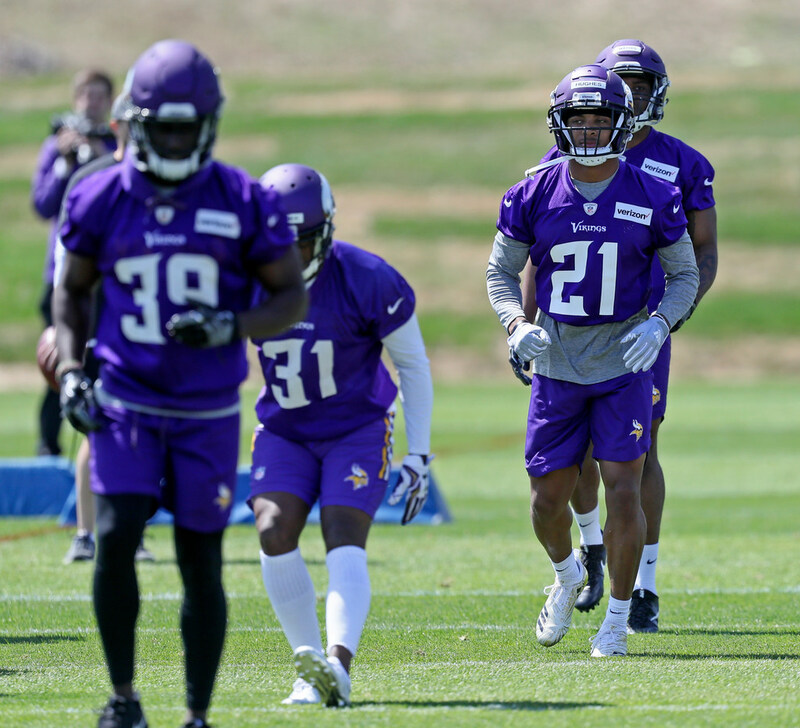 Playing the slot remains a focus for Vikings rookie cornerback Mike Hughes, who ended the offseason program making a couple of nice plays during Thursday’s practice. The Vikings shortened practice by about a half hour while planning to host an alumni barbecue afterward, but Hughes still had time to stand out with the reserves. The top corners continue to be Xavier Rhodes, Trae Waynes and Mackensie Alexander. Hughes, the 30th-overall pick, made his first play from the slot, where he jumped a route by receiver Cayleb Jones for the pass deflection. Hughes did. He made another play when a tipped Kyle Sloter pass flew off the hands of tight end Josiah Price and into Hughes’ arms. The rookie ran the interception back to the end zone. After 13 full team practices learning the nickel corner position, in which he’s fairly inexperienced, Hughes said the plan is to remain there in the slot heading into training camp in late July. -The defense continued to look ahead of the offense on Thursday, with the lone big play on offense coming from backup quarterback Trevor Siemian. Receiver Tavarres King beat cornerback Marcus Sherels down the sideline on a go route, and Siemian found King for the long touchdown pass. Kirk Cousins and the top offense stalled in their final 11-on-11 drill, leading to a Ryan Quigley punt. Earlier, linebacker Anthony Barr deflected a Cousins pass intended for receiver Adam Thielen during a team drill. It’s to be expected with an offense featuring new play and cadence callers against one of the league’s best defenses. –Mike Remmers sure looks like the starting right guard, unless the Vikings are sold on another option in training camp. Remmers lined up at right guard during the last five of the six practices open to reporters this spring. Rashod Hill, who said this week he has lost 12 pounds from last season, was the starting right tackle for most of the offseason program. Rookie Brian O’Neill has lined up as the backup right tackle. Tom Compton and Danny Isidora are also options at right guard. –Defensive end Everson Griffen and safety Andrew Sendejo enter the summer rested. Both starting defenders didn’t do much in OTAs while being sidelined with undisclosed injuries. Griffen, as the Star Tribune reported this week, is expected to be 100 percent for training camp, according to a source. Center Pat Elflein also has not participated in OTAs while recovering from ankle surgery. He said last week he’ll be ready for camp in about five weeks.